You are here: Home / z / Is Paul teaching Calvinism in Romans 3:10-12? Of all the various texts used to defend the Calvinistic teaching on Total Depravity, Romans 3:9-20 is one of the most popular (another being Ephesians 2:1-3). Rather than quote the entire passage, a few select verses from the beginning of this section are representative of the whole. As it is written: “There is none righteous, no, not one; There is none who understands; There is none who seeks after God. They have all turned aside; They have together become unprofitable; There is none who does good, no, not one” (Romans 3:10-12). It is not difficult to see why these texts are popular among Calvinistic defenders of Total Depravity. The text clearly teaches that nobody is righteous or does any good, which sounds like Total Depravity, and that nobody understands or seeks after God, which seems to infer total inability. Below are a few quotes from Calvinists on Romans 3:9-20. The text … moves in a remarkable way from the general to the specific. 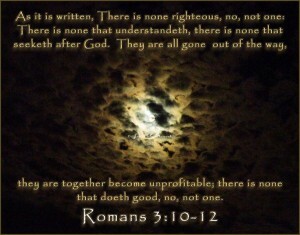 Not only does it say there is none righteous, but it says there is none who does any good, no, not one. We are not considered unrighteous because the dross of sin is mixed together with our goodness. The indictment against us is more radical: in our corrupt humanity we never do a single good thing (Sproul, Grace Unknown, 120). According to Romans 3, no one unaided by God 1) has any righteousness by which to lay a claim upon God, 2) has any true understanding of God, or 3) seeks God (Boice and Ryken, Doctrines of Grace, 79). Despite these sorts of statements from Calvinists, Romans 3:9-20 does not actually teach either Total Depravity or total inability. While Romans 3:9-20 does teach that all are sinners (cf. Romans 3:23), the overall context of this passage must be understood in light of the progression of Paul’s argument if we are to grasp his point. In other words, though this passage does seem to defend both Total Depravity and total inability when quoted out of context, when studied in its context the passage teaches something else entirely (See Campbell, The Deliverance of God). To fully grasp the argument, a complete analysis of Paul’s entire letter would be necessary. But since that is impossible to do here, let me try to just point out a few of the highlights. First of all, it is critical to note that the overall message of Romans is not about justification or how to receive eternal life. 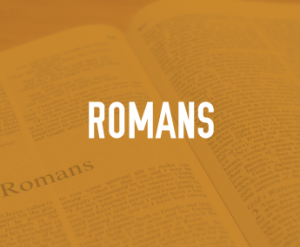 In other words, Romans is not primarily directed toward unbelievers. Instead, the message of Romans is primarily directed toward believers, and specifically, how they can live and function as followers of Jesus who live according to the gospel of Christ (Romans 1:16-17). Related to this, it is important to note that “salvation” in Romans is not about how to go to heaven when you die, but about the salvation (or deliverance) that God provides to believers. Lots of people think that Romans is just about how “unsaved” people can get “justification” so they can go to heaven when they die. But this approach to Romans doesn’t really know what to do with Romans 9–11 when Paul seems to suddenly switch gears and start talking about God’s covenant with Israel. However, if we understand that Paul is primarily writing to believers and instructing them about the deliverance available to them in this life, then Romans 9–11 becomes immediately applicable, for Paul uses the example of Israel to show what happens when God’s people do not live by faith, and as a result, are not delivered. And don’t think that Paul is threatening believers with hell. Hell is nowhere in Paul’s discussion in Romans (not even in the phrase “the wrath of God”). So when Paul writes what he does in Romans 3:9-20, he is writing a warning to believers in Rome about becoming proud of their privileged position before God. In this section of Romans, Paul is pointing out that all people are on equal footing before God. There is no privileged position. Third, and related to this, it is critical to understand exactly how Paul goes about making his argument. He is using specific rhetorical rules from the first century called epistolary diatribe argumentation. Paul didn’t just sit down and write Romans based on whatever he wanted to say. No, in writing Romans, Paul followed a set pattern and structure which was quite common in the first century for when scholars, philosophers, and teachers wanted to refute the ideas of an opponent. A large part of this diatribe structure involved quoting the ideas and words of your opponent so that you might then turn around and refute them. This means that some of the statements in Romans which have traditionally been attributed to Paul are actually the ideas and statements from an opponent of Paul, whom Paul quotes so that he can then refute those ideas (See Campbell, The Deliverance of God). So Romans 3 is not exactly a continuation of Paul’s own argument and logic, but rather, a continuation of the argument Paul is having with an imaginary objector. In other words, Romans 3:9-20 is part of Paul’s rebuttal of an opponent, not a continuation of his own argument. In this way, Paul’s collection of quotations from the Hebrew Scriptures in Romans 3:10-18 is intended to show his objector that despite being the chosen people of God and having the Law and the Prophets, the Jewish people are just as guilty as the Gentiles. Up to this point, Paul’s objector was trying to argue that only the Gentiles were guilty, and that the Jewish people had a privileged status before God. Paul’s point in Romans 3:9-20 is that if the Jewish people did have a privileged position by virtue of having the “oracles of God” (Romans 3:2), then these oracles of God condemn them all as sinners, which puts them right back on equal footing with the Gentiles. In Romans 3:9-20, Paul defends this point by quoting numerous texts from the Hebrew Scriptures which condemns them all as sinners. So far, we have only really looked at the context of Romans 3. Tomorrow, we will discuss what Paul is saying in Romans 3. Until then, what do you think about the context of Romans 3 as laid out above? Has anybody read that book by Campbell? What do you think of it? We Protestants labour under a Lutheran interpretation of Romans. He lived under the threat of hell with the alternative and only slightly less ghastly prospect of purgatory. He needed to know how to get right with God to avoid these two fates and find heaven. He found the answer in Romans and thence the Reformation. But this is not what Paul was trying to say. Paul was not mapping out a route map to heaven, but was rather saying that the people of God were now constituted by faith in a faithful Messiah. In order to do this he demolishes any Jewish boasting in the Law by showing that they had failed to keep both it and also their mission to the world. Now both Jew and Gentile must boast in the Messiah Jesus. Thus Paul’s proving that all had sinned was not to establish grace over and against law (its not by trying but by trusting that we get to heaven) but rather that both Jew and Gentile are established as God’s people by faith in Messiah Jesus. Its ironic that a book that promotes unity led to the schisms in the Reformation. Yes, I think I agree with this. Romans is a call for Jews and Gentiles to be unified by faith in Jesus. It is not a tract on how to get to heaven when we die. I have several good books which lead me in this direction on Romans, but am curious which ones (if any) you recommend? All these ideas come from N T Wright and his new perspective on Paul. Two of books I have read are, Justification and Paul and the faithfulness of God.